I’m new to your system (~2 days) and can already feel my teeth becoming much cleaner. I can’t wait to see the results after a few months!I have a quick question about using granular xylitol. Is it necessary to dissolve it in water or can I let the grains dissolve in my mouth? I’m sure the mints would be more convenient I’m just trying to find ways to cut costs! I am so happy that you are trying xylitol and my system, remember, it does not matter how you use the granular xylitol. It is not necessary to dissolve in water and perfectly fine to let the grains dissolve in your mouth. A one pound bag of granular xylitol should give you about 112 teaspoons and all you need between 1-2 teaspoons a day for oral health. Xylitol is most effective if it is eaten in small amounts at the end of meals, snacks and drinks so it would be at least 4-5 times a day. You may want an old “salt spoon” (a tiny teaspoon) to dispense a quarter of a teaspoon each time. This means that a bag should be enough for 2-3 months according to my calculations! If you are eating it off a spoon it is best to allow the grains to dissolve in your mouth “wipe” the sweet solutions over your teeth as the crystals dissolve. Mmmmm delicious! You have virtually made your own mints! Are you using the mouth rinses I recommend? 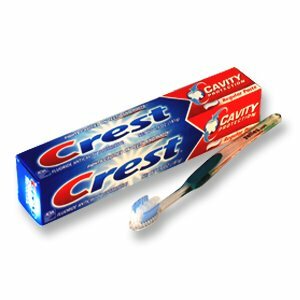 If not, I would at least urge you to consider Crest Original Toothpaste (picture included!) and rinse with ACT anticavity rinse before bed. The xylitol and ACT work in harmony to protect and beautify your teeth. Welcome to the wonderful world of xylitol!